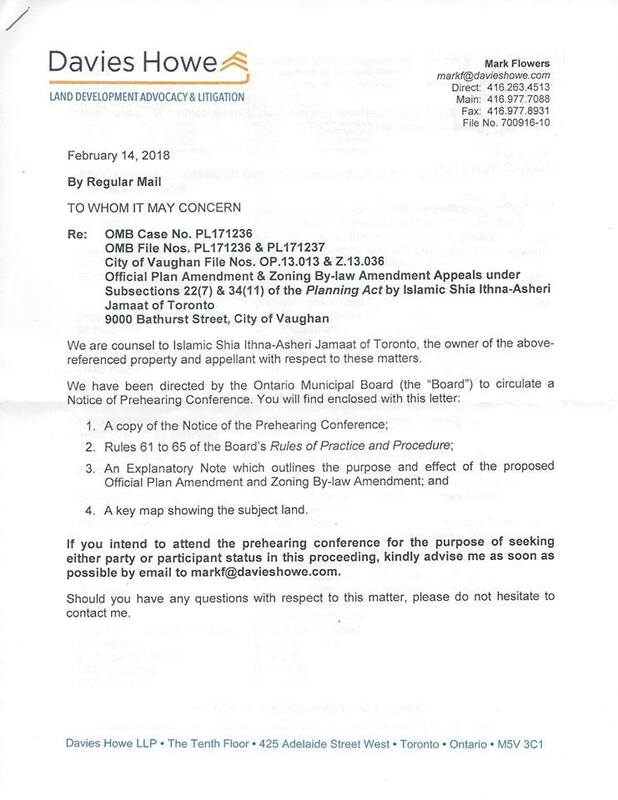 VERY URGENT UPDATE: By now, many of your have checked your mailboxes and have received an official letter from Davies Howe LLP indicating that the Islamic Shia Ithna-Asheri Jamaat of Toronto (i.e. the Jaffari Community Centre) has launched an Ontario Municipal Board (OMB) challenge against the City of Vaughan with respect to their development application at the corner of Ner Israel Drive and Bathurst Street. So what does this mean? The applicant is claiming that the City of Vaughan has taken far too long to approve their original 2013 application (and amended five times) to build a 6 storey seniors building, an 8 storey condominium building, 60 townhouses, a 3 level parking garage (adjacent to the Waldorf School) and a private Islamic High School on the site. They have appealed to the OMB asking them to overrule the City of Vaughan’s official plan to allow this development to be approved. As we had posted earlier, they registered their appeal with the OMB prior to the new OMB legislation (i.e. Ontario Bill 139) being proclaimed into law and their case is entitled to be heard under the old OMB rules and processes. An OMB Pre-Hearing has been scheduled for Tuesday March 27, 2018 (10 am) at Vaughan City Hall and Davies Howe LLP has sent out notices to all residents who requested updates on this development application. PTWA will be attending the Pre-Hearing on March 27 and all residents in our community are entitled to attend this session for the purposes of seeking either “Party” or “Participant” status. You are welcome to attend the Pre-hearing to stay informed or to just make your presence felt to both the OMB and the City of Vaughan. The purpose of the Pre-Hearing is to identify all Parties who wish to participate in the OMB hearing and to agree on a future date to meet again to decide on procedural orders and and major issues. PTWA also met with the City of Vaughan this week to better understand how they will respond to the appeal of this application to the OMB. They have indicated that their Planning Department is currently working on a final staff report that will provide Council with final recommendations on this application. This report will be sent to Vaughan City Council some time after the March 27 Pre-hearing. They also confirmed that a full Committee of the Whole (Public Hearing) on the staff recommendations will be scheduled in June to allow the public to provide input before the council votes on the city’s position for the OMB hearing and the final status of the application. A very strong public turnout for the June public hearing is CRITICAL. PTWA’s team of professionals are now engaged and we are actively preparing for the Pre-Hearing. As you can imagine, the OMB hearing process requires a considerable amount of money to pay for the legal and planning experts that are required to put a strong case for the community forward. 1) We are asking everyone in the community to make an immediate donation to help support this new phase of the appeal process. This development will have a significant impact on our community and it is crucial that we have the financial resources available to properly represent our interests at the OMB meetings. Please click on the following link to make a donation to our Ratepayers Association. You can also send us a private message to arrange for a pickup if you would prefer to donate via cash or a bank cheque. We will continue to send out updates as we receive additional information. Please feel free to post your questions and comments. Please monitor our Facebook page for more frequent updates.